A couple months ago, hints were dropped that the Transformer known as Bumblebee would return to his original automotive form, a yellow Volkswagen Beetle, for the new standalone Bumblebee movie currently in production. Now, we have what appears to be photographic confirmation of this, and, even better, I have determined the year of Beetle that will portray the noted transforming robot. The decision to have Bumblebee be a Camaro instead of a Beetle in the recent series of Transformers movies was, I believe, a terrible mistake. Those movies were directed by Michael Bay, an anthropomorphized explosion that was taught to smirk and poorly direct movies by a cinema-hating witch, and Bay is not directing the standalone Bumblebee movie, so director Travis Knight was free to return Bumblebee to his proper and historic automotive form. That Beetle was a 1974 Super Beetle (despite the ‘71 on the windshield). They made a good choice; to many, 1967 is considered the Zenith Year of U.S.-spec air-cooled Beetles. It was the first year of a 12V electrical system, dual-circuit brakes, the 53 horsepower, 1500cc engine, and the last year of the lovely chrome bumpers with the big guards and towel-rail overriders. I prefer the 1300cc from 1966, personally, but I’m a sucker for the old sloping, dual-glass headlamps. That Beetle is not a 1967 Beetle, though it’s clearly dressed to look like one. 1967 Beetles had a one-year-only long engine lid with no stamped central rib, and Bumblebee there clearly has the shorter engine lid from 1968 and up. My guess is that car is one from between 1968 and 1970, since it lacks the little parentheses-shaped air extraction vents behind the rear quarter windows that arrived in 1971. If, improbably, you want to know more about VW engine lid (also called the decklid) changes, I covered that in painful detail here. 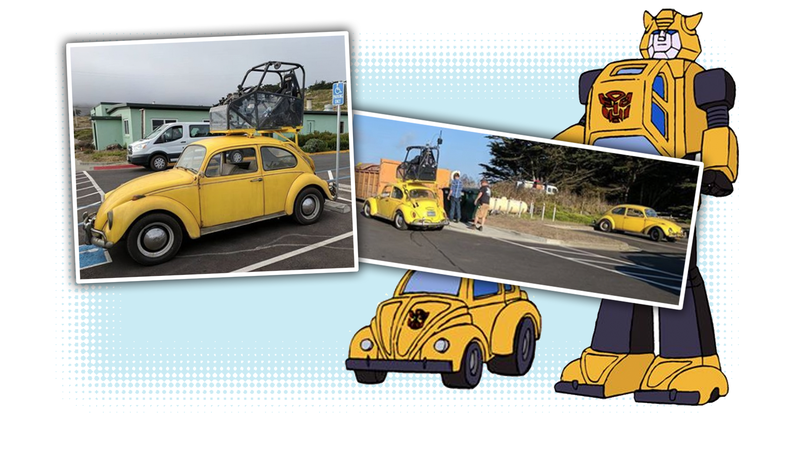 So, here’s what we do know: Bumblebee will once again be a Beetle, the Beetle in the movie’s universe will be a 1967 model, but the reality is they’re likely using a bunch of other year Beetles dressed up as ‘67s, which is by no means uncommon for movies. Even the Love Bug series did this all the time. I’m glad we got this all sorted out. You must be very relieved. You’re welcome.